It started, as these things so often do, with a chance meeting in a bar. Mike, who was sitting next to me, happened to mention that he was part of the Australian free fall team, one thing led to another and without too much more ado I found myself clambering into a jumpsuit at Canberra airport. Next to me was Lyn, who to everybody’s surprise – particularly her own – had decided to jump too; an interesting decision for somebody who has trouble looking down over the edge of a kerb. First came a couple of exercises, demonstrating the positions that we should adopt while plummeting from the heavens. Then six of us – Lyn and myself, our two tandem instructors, the pilot and Bruce the cameraman – piled into the tiny aeroplane and headed for the wide blue yonder. 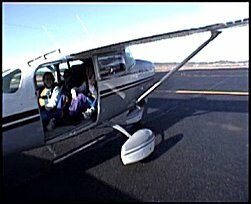 This plane has no door! The single-prop plane clawed slowly for altitude. Canberra drifted away into the distance, revealing the harsh bush land beyond. Little green tempered the raw rock and earth, and from our vantage point the sun reflected off the only water; the glittering snake of the Murrumbidgee River, and the tiny rainwater dams hacked from the land by generations of sheep-farmers. From ground level, the bush seems lush. From the air, you see it as it really is, hard-baked and dry. It was loud in the little plane, and we were packed in like sardines, shifting occasionally to ease sleeping limbs, but it was a beautiful day and we were gently lulled by the land dropping slowly away. Suddenly Graham, my instructor, poked his altimeter over my shoulder so that I could see it. “Four and a half thousand feet,” he said. “This is where the parachute opens. Everything above this is free fall.” I nodded, and looked down through the clear piece of perspex that constituted the door. It didn’t seem so very far down. The plane clambered higher. 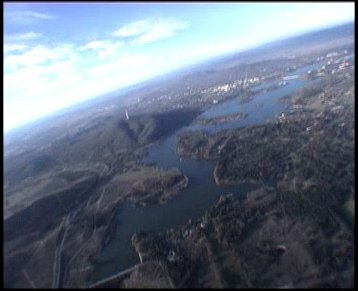 Some time later, we turned round and headed back to Canberra, still climbing. We had clearance to jump from ten thousand feet, and we were due to land on the cricket oval by the Australian Mint. The earth continued to drop away. And then, suddenly, we were there. Can you hear her yet? Bruce the cameraman was already clinging to the fuselage. I was next. 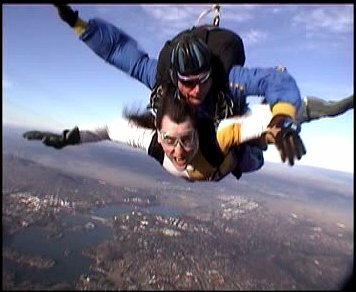 Laughing like a madman, I was launched out into the clear blue sky. The feeling of speed was astounding. Somehow I had not really thought about just how windy dropping at terminal velocity was going to be. Even so, above the howl of the wind, I could faintly hear Lyn screaming as she plummeted away below me. Bruce, with helmet cam attached, arrived in front of us, filming. I tried to explain how fantastic it all was, but it was impossible to talk against the blast of the air and anyway I couldn’t stop laughing. Some thirty seconds and around five thousand feet after leaving the aircraft, Grahame pulled the ripcord. I had expected a violent tug when the parachute opened, but in actual fact the only real sign that something had happened was that Bruce and the camera abruptly vanished. And then… from manic howling madness to gentle floating peace, drifting like thistledown above the bush city and Lake Burley Griffin. Gently we twisted and turned, coasting slowly lower, until eventually we could make out the green cricket ovals, and finally the watchers waiting beneath. The landing was quiet and serene; we simply lifted our legs up and slid along on our backsides, and the ride was over. And Lyn? 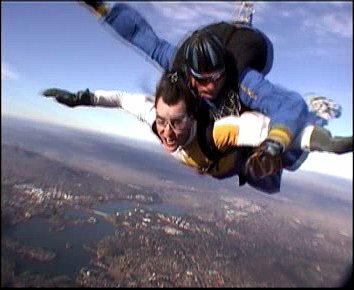 She had screamed for the whole free fall, and was hoarse for days afterward. Would she do it again? Absolutely. This entry was posted in Australia, Oceania, Travel on 2003/06/01 by Reinhard.